Nodding Donkeys: Ophir results - Acting counter-cyclically... or not? With this caveat in mind, Ophir is indeed taking advantage of lower seismic rates and increasing activity rather than reducing spend too much. For instance it tripled the size of its 3D seismic survey in Myanmar in Feb 2015 for the same budget. For 2015 Ophir only has two commitment exploration wells targeting low-cost, high-value liquids liquids in the Gulf of Thailand from the legacy Salamander portfolio. After the extensive acreage reload of the last 12 months (doubling its exploration footprint), Ophir sits on 12 exploration plays in five countries. The majority is oil and rest "easily monetisable" gas. Everything is expected to work at $50/boe. Ophir management's personal Top 3 plays are Myanmar, West Papua (Indonesia) and outboard Gabon, despite last year's non-commercial wells – Ophir is now interpreting 3D seismic shot in 4Q14. In 2H15 Ophir should be able to select drilling targets for 2016-17. It could drill in Gabon and the Seychelles in 2016 and in Indonesia in early 2017 (previous expectation was 2016). This is the time when it truly could go counter-cyclical. partner alignment with the Statoil/Exxon consortium in Block 2 is less than perfect, despite what Ophir/BG are saying publicly. As a non-operated junior partner in a big LNG project, Ophir has little control on the project timeline, now more dependent than ever on Majors' top-down capital allocation decisions. All in all, first LNG in Tanzania looks set for 2022, a whole four years after the original start-up date of 2018 tentatively given back in 2011. In our minds, this once again highlights how easy it is for big projects to be delayed. In EG, the MoU with Excelerate in Nov 2014 for a 3mpta FLNG vessel was a major milestone. Ophir now needs to finalise chartering agreement for the FLNG vessel. It is targeting a FEED award on both upstream and midstream by end-2015, FID in 2016 or 2017 and a start-up in 2020. EG is seen as ideal to prove up FLNG concept given dry gas (simple topsides) and good metocean conditions, leaving little technical risk in Ophir’s view. $1bn gross capex to first gas. Its landed cost of LNG in Asia is seen at $10/mbtu, which seems very low to us. What does it take to make an LNG project fly? ... so that buyers come in. Only item #4 (land/midstream) is missing for Tanzania and EG. Once that’s agreed, buyers should consider the projects to be “real” rather than “possible” or “speculative”, paving the way for gas SPAs. Big "E", small "P" - is this a sustainable business model? 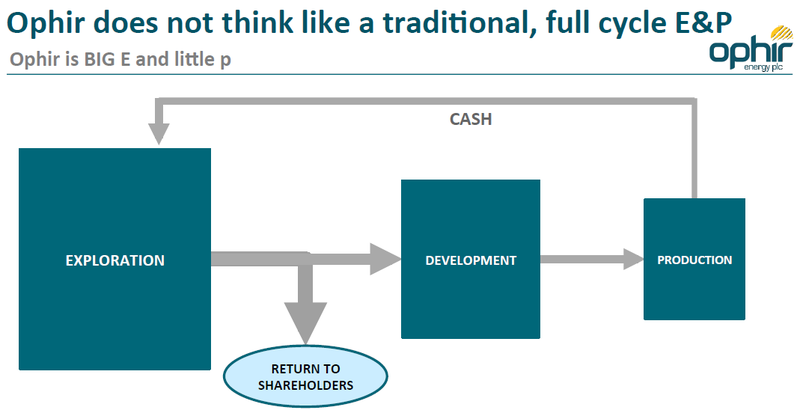 Ophir's thinking and strategy is quite similar to Tullow (at least up until recently): producing assets’ raison d’être is to generate OpCFs that are reinvested into the E&A business. The Salamander acquisition, completed in March 2015, was essentially a (late) recognition from Ophir management that Ophir needed to own producing assets to move towards a more sustainable, self-financing business model, as the company can’t solely rely on farm-downs/disposals to fund its E&A programme. This is all very sensible in light of the countless farm-out delays and number of upstream assets for sale these days, making a purely disposals-driven funding model unsustainable in our view. Having said that, Ophir remains mostly about “E” rather than “P”. Its overarching goal is to avoid development capex, hence why there is very little focus at Ophir on production targets. Indeed group production is seen down to 10-12kbd in 2015, down from 14.2kbd in 2014. Ooops. Part of the reason is that the Kerendan (Indonesia) operated gas development delayed from 2015 to 2H 2016 - this was known pre-Salamander acquisition and outside of company control. Salamander assets are expected to generate c $150m of cash in 2015 from the non-operated Sinphyhorm gas field and the operated Bualuang oil field in Thailand. Nice but still well below a reduced 2015 capex budget. Salamander assets are seen as low-cost with a $15/bbl break-even. In line with Ophir's focus on the "exploration" part of the E&P lifecycle, the company is looking to farm down assets. Four assets could be candidates: Kerendan (development) and Bualuang (producing – Salamander previously received buyer interest), or its 2 LNG projects ahead of FID. Conversely, Ophir says it is unlikely to farm into further assets in 2015 given substantial acreage reload over the last 12 months and the Salamander acquisition. 2015 capex guidance cut by another 15% from previous guidance to $250-300m, down >50% y/y from $580m in 2014. Previous guidance from Nov 2014 was $300-350m. Within this, only $35m is committed exploration capex (with a similar run-rate in 2016-17). The remainder is discretionary seismic capex. Ophir could shift seismic spend from one country to another, but overall 2015 budget shouldn’t move much from here. This means Ophir can cherry-pick the best opportunities.